Cooling Fundamentals: Beware the CPU fan of DEATH! Beware the CPU fan of DEATH! A few of us have smelt the acrid odor of melting plastic emanating from the depths of a computer. Thankfully not all of us have had to buy a new processor the very next day because the CPU fan failed, and the processor overheated itself into oblivion. 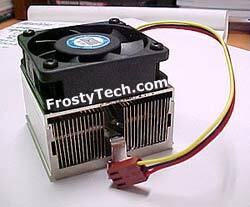 In most instances the fan will simply stall causing the heatsink to rise in temperature. Thankfully! If an adequately designed heatsink is on the processor nothing too harmful will happen. But if an under powered heatsink is incapable of handling the heat load of the processor all hell will break loose. Double that if you happen to overclock your processor! Let's recap for a moment the few options for destruction we face... CPU cooler fans can seize up, either because of dried out lubricant, some kind of mechanical damage or accumulation of dust. 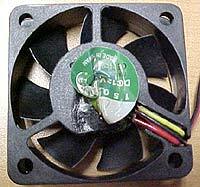 Old fans can also become noisy, and experience a loss in RPM's due to poor bearings, usally of the sleeve variety. Lastly, and what we experienced with our brand new two-day old copper-finned heatsink from COMDEX, is the burning pile of melted plastic failure! Ironically if it wasn't for the smell of the burning plastic, my little ol' FCPGA PIII 700Mhz processor might have become a hood ornament. Regardless, the culprit was removed in time. Looking closely at the fan we saw some damage immediately. We've been informed that "Motor One" a company apparently owned by Sunon, a Taiwanese company, makes the 12V 0.13A, 14 CFM 50mm fans (pictured below) that we highly suggest you avoid at all costs . To be fair, some of you have reported using fans manufactured by the same company for years without problems - which is exactly how it should be with a fan! Alive and well. Burned up and Toasted after 1 day! Keep in mind that this fan had been in use for less than 24hours. Whatever happened to 50,000 hrs MTBF? My first thought was the heatsink, which is one of those cool never before seen in North America types that seem to pop-up at COMDEX, had been unable to handle a measly 700Mhz PIII. But no, the case would seem to be a component failure in the circuitry powering the fans' motor. The fan was attached to the still very promising Thermal Buster heatsink (review to come shortly). 1: — Cooling Fundamentals: Beware the CPU fan of DEATH! List all Sunon heat sinks that Frostytech tested?